Removal ProcedureRaise and support the vehicle. Refer toLifting and Jacking the Vehicle. Clean and inspect the drain plug and case sealing surfaces. 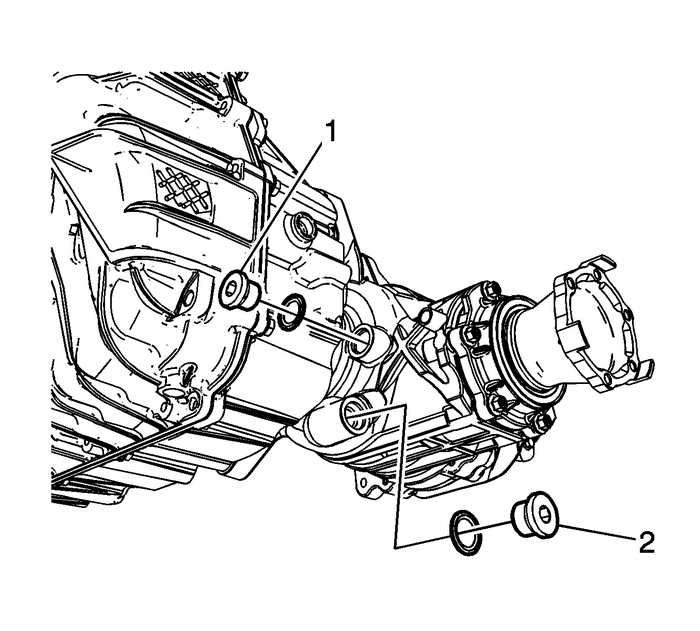 Install the drain plug-(2) and tighten to 39-Y (29-lb-ft).Fill the transfer case with gear lubricant to the bottom of the fill plug, or 0.80-L(0.85-qt). Refer toAdhesives, Fluids, Lubricants, and Sealers.Install the fill plug-(1) and tighten to 39-Y (29-lb-ft).Lower the vehicle.